I don’t know much about OBS. From a quick look at their website it seems like they specialize in RDA, RTA and tanks. Heaven Gifts sent one the newest OBS products, the Engine SUB tank. 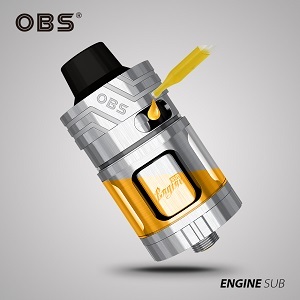 In addition to the Engine SUB, OBS has several other devices bearing the Engine name, the SUB Mini, Engine temperature control and Engine NANO RTA. 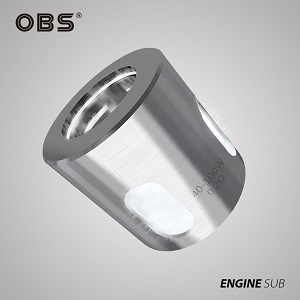 The Engine SUB is a top side filling, 5.3 ml capacity tank. It has what OBS refers to as an untraditional top airflow system. 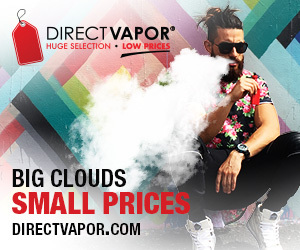 It ships with two 0.2 ohm organic cotton coils with a suggested wattage range of 40 – 100 watts. OBS also includes a spare glass tube and a set of replacement O-rings. To fill the Engine SUB simply lift up on the top cap to reveal the fill port. Tilt the tank and insert your dripper or tip of the ejuice bottle to fill. Airflow is adjustable by twisting the collar at the top of the tank. If you’re using a new coil, be sure to prime it first by dripping a few drops of ejuice directly onto the cotton that’s visible through the ejuice ports. Allow the coil to sit in a full tank of ejuice for a few minutes to fully saturate the cotton before vaping with a new coil. Access the coil by unscrewing the base of the tank. The entire OBS Engine SUB comes apart pretty easily for cleaning. Be sure to screw the parts back together snugly before filling with ejuice and vaping. I filled the OBS Engine SUB with Cinnanutz ejuice from Vapes Gone Wild, and attached it to a VaporFi VEX 150 TC mod. With wattage set at 60 watts and airflow about half way open I gave it a first vape. I was very impressed with both vapor and flavor production, especially at that mid-range power setting of 60 watts. The vapor was a little on the warm side and the cinnamon popped. I upped the power to 75 watts and both vapor and flavor increased, though the vapor itself didn’t seem to get much warmer. As with a lot of cotton coils, especially those for the SMOK TFV4 and TFV8 tanks, there is a little breaking in needed to burn off that little “new coil” taste note, but it went away after a few minutes of vaping. Over the next week or so I’ll be using the Engine SUB extensively and then will post a full, in-depth review. If you follow Seven Report on Twitter or Facebook you’ll out there when that review is live. You can find out more about the OBS Engine SUB tank and order one from Heaven Gifts, who supplied the tank for a Seven Report review.